The suspension of "Bond 23," the new James Bond film that's trapped in development limbo thanks to the uncertain future of MGM, has led to a new and rather unexpected question: Has Daniel Craig's time come to an end? Daniel Craig's selection as the new James Bond was met with a certain amount of trepidation among fans, but that went out the window in a hurry when Casino Royale, his first turn in the role, proved to be one of the best Bond films to come along in years. It was a major departure from the series and, in the eyes of many, a welcome respite from the gadget-driven glibness the franchise had taken on while in the care of Roger Moore and Pierce Brosnan. But production on his third Bond movie, code-named Bond 23, has been halted "indefinitely" while the mess at MGM gets sorted out and while there's no question that another Bond film will be made, and little doubt at this point that Craig will star, the possibility that he may be replaced if the delay grows too long is suddenly being kicked around. As the BBC notes, previous lengthy breaks between films in recent years have resulted in new actors taking over the role: Craig took over from Brosnan following a four-year gap between Die Another Day and Casino Royale, while Brosnan inherited the job from Timothy Dalton after a six-year hiatus between License to Kill and GoldenEye. If the MGM trouble drags on, could it be that Craig will be out after only two films? And if so, who will step in to take over? According to British bookie William Hill, the number one choice is Sam Worthington, best known for his work in Terminator Salvation, Avatar and Clash of the Titans, and who actually screen tested for Casino Royale but was beaten out by Craig. Following him is Welsh actor Christian Bale of Dark Knight and bad temper fame, and, believe it or not, Will Smith. Yes, that Will Smith. 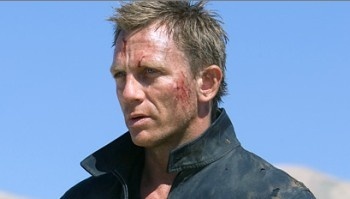 Boy, I sure hope Daniel Craig comes back.